STANFORD-ON-SOAR. 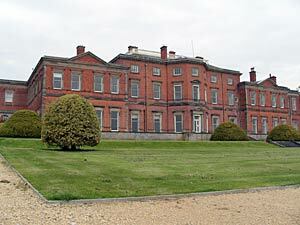 It is the Farthest South of Notts, pleasant with trees and red gabled houses. By the grass-bordered road the village pump stands under a shingled roof with a graceful birch at each side; and a carved oak lychgate frames a pretty picture of the church, with stately elms and sombre yews about it. Under one yew, magnificent with a spread of branches covering a patch of ground 70 yards round, Charles Stuart and Sir Henry Skipworth are said to have conferred before the siege of Leicester. Quiet as the village is, it has seen much change. With the coming of the railway the course of the River Soar was diverted, and there is now a high embankment between the river and the village. Near the church a small hump-back bridge which once spanned the stream stands among weedy shallows. It saw the passing of the ancient manor house by the church, and the building of a great house by Robert Raynes in the time of Charles Stuart, on what was then a barren hill over a mile away. The present hall is on the same site, but the bare hill has changed, for a tree-lined road brings us to a park with glorious elms and limes and lovely grounds, widely known as the home of Sir Julian Cahn, whose cricket team is the delight of thousands who come here to see it play. During last century the village was almost rebuilt by the Ratcliffs whose initials are on some of the houses and on the attractive pump. There are blocks of Mount Sorrel granite in the base of the splendid 15th century tower of the church, whose oldest part is the 13th century arcade opening to the south aisle which was widened two centuries later. The north arcade is 14th century, and the fine clerestory was built about 1500. The chancel is made new, and the modern porch is on old foundations. Old relics are a piscina, a stone altar with five crosses, part of a coffin stone and a fragment of 13th century moulding in the vestry wall, and small original figures of angels at the ends of the tie-beams in the nave. The peace memorial lectern is part of the good woodwork of our time, and the modern font of richly tinted alabaster has lovely groups in white marble of Jesus with the children and Mary with Him as a Babe and the boy John the Baptist. On the chancel floor is the fine 14th century brass portrait of a priest in robes, holding a chalice; it is one of only two ecclesiastical brasses in the county, and may represent Adam de Rothley. On an alabaster floorstone are the charmingly natural engraved figures of two Illyngworths of the 15th century, their faces rather worn. In a recess in the wall of the north aisle, which he may have founded, lies the strange figure of a 14th century civilian with short hair and beard, high cheek bones, tightly closed lips, and a very long neck. He wears a closely-buttoned gown, has a sword, a dagger, and a pouch, and holds a heart in his folded hands. Part of his legs are missing. For a long time he has been known in the village as the Indian. It was Thomas Lewes, a London alderman who bought the manor from the Raynes family, and the raised vault of this family and the Dashwoods (whom they married) spoils the south aisle. Among their memorials is an inscription to Samuel Vere Dashwood, rector for 49 years of last century; and a charming little monument of 1911 to Elizabeth Dashwood has the head of a woman with two children standing out in white marble on a blue ground. STANTON-ON-THE-WOLDS. Its cottages and farms are clustered on the windswept Wolds, and the tiny church is almost lost in trees. From the golf links by the churchyard there is a fine view of the Trent valley. 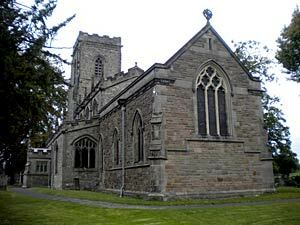 After years of neglect, the church was made neat and pleasing by the beautiful lady who sleeps in Widmerpool Church. 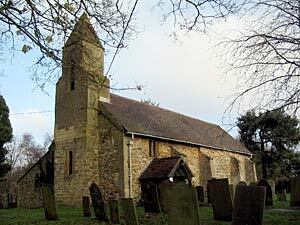 It has only a nave and chancel under one roof, with a bellcot, but the nave has traces of Norman work in its walls, and the round bowl of a Norman font is cemented to the floor. A medieval lancet lights the west wall, the shapely little east window is 600 years old, and one with dainty tracery under its square head is only a little younger. The old piscina and aumbry are here, and the tiny 14th century doorway in the porch has a modern door covered with the lovely scrolls of two hinges. Two echoes of troubled days this village has. Colonel Hutchinson is said to have escaped from the house by the church when surprised by a party of Royalists one day in the Civil War; and we are reminded by a floorstone to Sir John Parsons of a family who, impoverished by the Civil War, came to live in the manor house, part of which still survives in the farmhouse by a clump of trees below the church. The family fell lower still, for in the 18th century one of its members was transported to America (after years of thieving and forgery), and was hanged at Tyburn for coming back.